to release our former eagle patient. 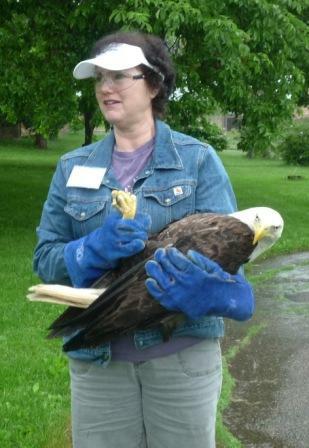 As you may recall, about four weeks ago, TRC admitted a male bald eagle from Duluth that was injured during a territorial flight (see stories from May 15 and May 16). Territorial battles between eagles during the breeding season is a fairly common occurrence these days, and most often, one or both birds become grounded due to soft tissue injuries from talon punctures. Fortunately, the injuries this bird sustained were treatable and today he was released in an eagle "neutral" zone along the St. Croix River. We thank the volunteers and our entire network of partners and friends who helped with this story, among many others. Our TRC Friends are World-Wide! Will You Help TRC to Help Baby Raptors? TRC and ACES - a Great Partnership!